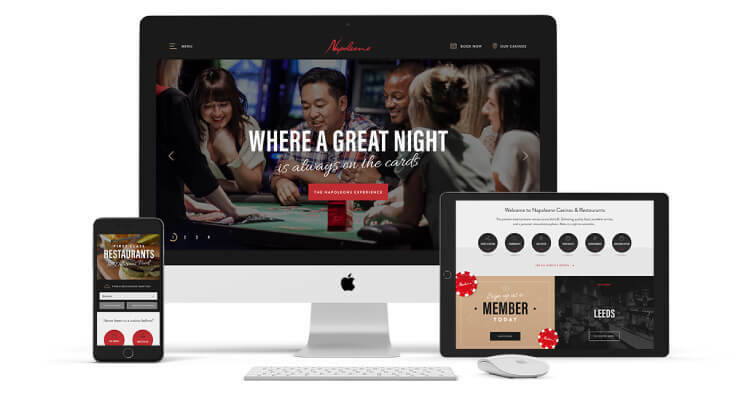 Today we’re pleased to announce that after months of hard work from the entire team, we have launched the new Napoleons Casinos and Restaurants website. As well as the design and build of the website, we undertook a full brand review resulting in creating brand guidelines, email templates, style guides and assets so the casino managers have a whole host of new ways to market events and offers. The new ‘look and feel’ was designed specifically to grab your attention, by pulling together 3 key typefaces with a newly focussed colour scheme we have a brand treatment that can be manipulated for any media channel. A new feature of the website is the ability to book a table at the restaurant online, by integrating with ResDiary we have eliminated an awful lot of time spent manually taking bookings. A big emphasis has been put on the events and offers that the casinos offer, we have developed a way of showcasing these throughout the website to provide the customer with a simple and quick way to browse what’s going on near them.